ST. PETERSBURG, Russia - For years, kopek-pinching Soviets sat down in a cheap restaurant in a former mansion of the nobility for plain meals, unaware of the treasure secreted nearby. 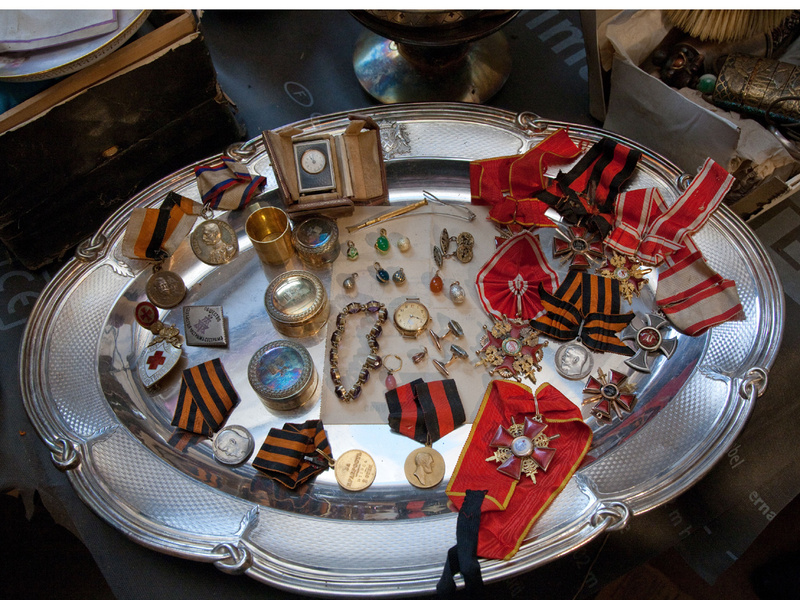 Workers restoring the building this week finally found more than 1,000 pieces of jewelry, silver service sets stamped with the name of one of Russia's most prominent noble families, mirrors and brushes in silver frames. It was unexpectedly discovered in a storage space hidden between two floors. Many of them were wrapped in newspapers dated from the early months of 1917, as Russia careened toward the Bolshevik Revolution that ended life as the nobles had known it. Friday's announcement of the find by the Intarsia company, which is performing the restoration work, excited the news media and sparked arguments over who can claim the valuables. The find is so new that experts haven't had time to inspect the goods and estimate their value. The treasure tale touches on two of Russia's most renowned and romantic figures: Peter the Great and Alexander Pushkin. The mansion was purchased in 1875 by Duke Vasily Naryshkin, whose family included Nataliya Naryshkina, the second wife of Czar Alexis and the mother of Peter the Great. The mansion had been put together by connecting two 18-century houses, one of which belonged to Pushkin's African grandfather Abram Gannibal. After the Bolsheviks nationalized private property, part of the mansion was turned into a stolovaya, a canteen-like restaurant serving utilitarian meals, according to Russian news reports. Following the collapse of the Soviet Union, the building housed apartment, became private apartments, then was purchased by Intarsia to be turned into a conference and cultural center. Intarsia said it would like to display the treasures for public view in the cultural center once it's completed; for now, they're in custody of the city's committee for historical preservation. But who has the final claim to them hasn't been resolved. Sergei Malinkovich, head of a regional Communist organization, told the Rosbalt news agency that his group will apply for ownership of the items on the grounds that the group is the successor to the Communists who nationalized state property. "The essential thing here is that at the moment of the creation of the hiding-place, the treasure was no longer property of the Naryshkins," he said. The state news agency, meanwhile, cited Ivan Artsishevsky, chairman of the House of Romanov in Russia, as saying it appears the closest relative to the Naryshkins who occupied the house lives in France, but that it was unclear if this person would seek the valuables.